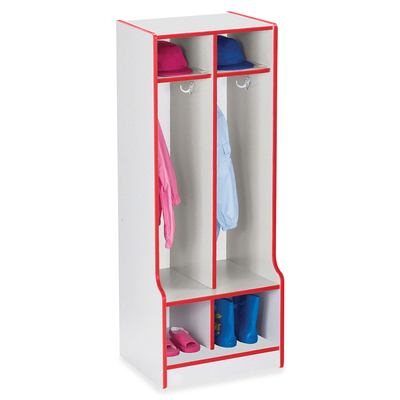 Give Each Child Their Own Locker Space And A Place To Sit With This Two-Section Coat Locker. Hang Jackets And Backpacks On The Double Coat Hooks In Each Locker Section. Open Shelves On The Top And Bottom Of The Locker Provide Additional Space For Boots And Lunch Boxes. Open Locker Section Features A Handy Edge To Let Children Sit While Tying Their Shoes Or Putting On Boots. Kickplate Prevents Children From Losing Small Items Underneath. Laminate Is Durable And Features An Easy-To-Clean Surface. Dowel-Pin Construction Prevents Weakening At The Joints, Where Most Of The Stress Occurs. Truedge Is Permanently Thermo-Fused To The Edges To Prevent Chipping. Kydzsafe Rounded Edges Allow Children To Play Safely Without Getting Hurt By Sharp Edges Or Corners..
Give Each Child Their Own Locker Space And A Place To Sit With This Two-Section Coat Locker. Hang Jackets And Backpacks On The Double Coat Hooks In Each Locker Section. Open Shelves On The Top And Bottom Of The Locker Provide Additional Space For Boots And Lunch Boxes. Open Locker Section Features A Handy Edge To Let Children Sit While Tying Their Shoes Or Putting On Boots. Kickplate Prevents Children From Losing Small Items Underneath. Laminate Is Durable And Features An Easy-To-Clean Surface. Dowel-Pin Construction Prevents Weakening At The Joints, Where Most Of The Stress Occurs. Truedge Is Permanently Thermo-Fused To The Edges To Prevent Chipping. Kydzsafe Rounded Edges Allow Children To Play Safely Without Getting Hurt By Sharp Edges Or Corners.